Well, I suppose it’s been about 5 or 6 months since I last posted here on Virally Suppressed and began writing what I hoped would become a honest-to-goodness book about my 39-day trip up, down and across America. That book has since been finished and, in the process of its writing, it has morphed into something that I could not have foreseen back in August. 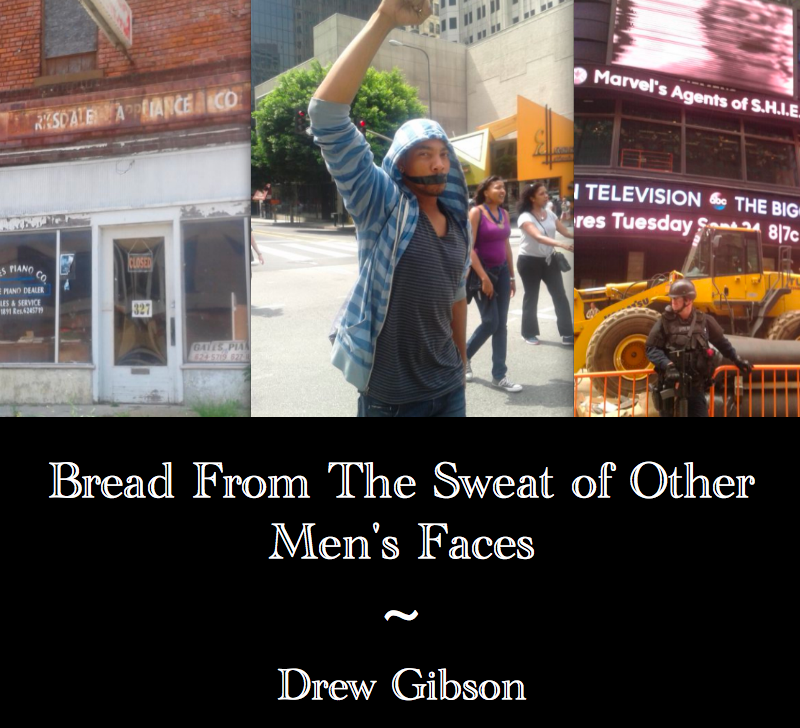 The title of the book, Bread From The Sweat of Other Men’s Faces, come from a line President Lincoln’s Second Inaugural Address in which he made a covert dig at the morality of the Confederate position on slavery by commenting on the strangeness of a people asking, “a just God’s assistance in wringing their bread from the sweat of other men’s faces.” The line itself is an allusion to the Book of Genesis, where god puts a curse upon the ground after discovering that Adam and Eve have eaten from the Tree of Knowledge, telling Adam that, “In the sweat of thy face shalt thou eat bread, till thou return unto the ground; for out of it wast thou taken: for dust thou art, and unto dust shalt thou return.” To wring one’s bread from the sweat of another man’s face is not simply a reference to the gross inequities of slavery, but to any society in which people grow rich and prosperous due to the labor others. In this Second Gilded Age that we find ourselves slogging through in America as of late, I thought the title more than a little apropos. In case you weren’t aware, the American West is huge. And I know that probably sounds glib, but I really don’t mean for it to. I truly had no idea just how massive it was until I had to drive through it. For example, I figured I could make it from San Francisco to the Arizona/New Mexico border in about a day. After all, I only had to pass through two states to get there. How hard could it be? Well, as it turns out, it’s remarkably hard because after a day’s worth of driving I was somehow still in the state of California. With the sun setting and the effects of my energy drinks wearing off, I decided to pull off I-40 and spend the night in the town of Needles, California. If you have never heard of Needles, you’re not alone because I was completely ignorant to its existence as well. Located in the easternmost portion of San Bernadino County, Needles is a town of about 5,000 people whose halcyon days occurred in the middle of the 20th century when it was one of the principle stops on Route 66. In John Steinbeck’s The Grapes of Wrath, Needles plays a prominent role as it is the first town that the Joads (and millions of other dust bowl families) see inside the state of California. As the federal interstate system eroded the influence of Route 66, any pretensions Needles had of notability went with it. Once I had checked myself into the local Motel 61 I headed down to the local 76 gas station to grab something to drink and ran into a clearly frazzled woman who was walking towards me and muttering something incomprehensible into her cell phone. Straight away I could tell that she was one of those people who were blessed with the sort of youthful beauty that its owner comes to take for granted and inevitably ruins by living harder than it would allow. With her red hair curled into barber shop pole ringlets and a bit of a toothy grin sitting atop a still decent figure she looked like the quintessential worn out actress. Her Kia had broken down halfway between Needles and the casino town of Lake Havasu City and her phone was out of juice, so she asked to use mine to call up customer service and get a tow truck. While we waited for the tow truck to come, we sat on the sidewalk, smoking cigarettes and drinking lukewarm diet coke from the Motel 6 vending machine. Periodically, a potbellied hispanic man with a joint in one hand and a Jack Russell Terrier in the other would come out of his room and listen to our conversation. Deborah: “I had to quit my job because of it. The pain was…I can’t even describe it. Imagine having somebody stab you in the spine over and over again for six months and you’ll be on the right track. 2When Deborah talks about her Social Security payments, she’s referring to Social Security Disability Insurance (SSDI), a federal insurance program for people who suffer from a serious disability that makes continued employment difficult or impossible to maintain. The average SSDI payment in 2013 was around $1,100 a month.